Jillian Mcdonald’s artwork in video, new media, and performance has, since 2006, examined the horror film genre, its affect on audiences, its archetypes and motifs, and the mechanisms of “fear as entertainment” at work in the genre. She creates scenarios in her work that emphasize the humour and absurdity that accompany this fear. 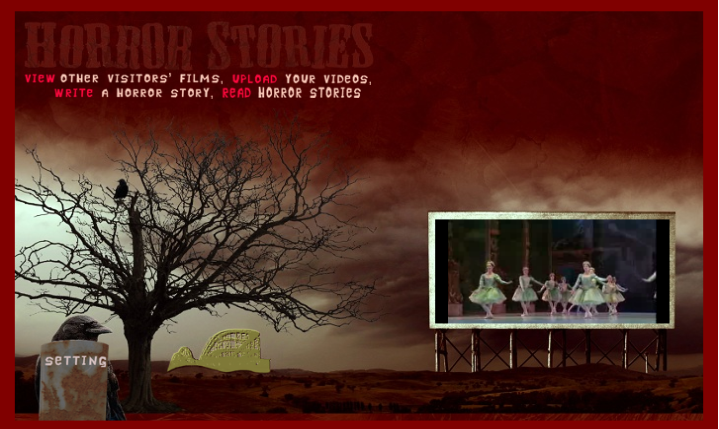 Horror Stories is a web-based artwork that enables an interactive and collaborative film-making experience. The work is not a film per se, it is a contemporary update and visual equivalent to ghost stories told around a campfire. That everyone wants to shoot a horror film might be an exaggeration, but the genre’s signature low budgets, repetitive motifs, minimal narratives, and clichés make the feat possible for many amateurs and fans. In Horror Stories the viewer’s experience depends on his or her own expectations of horror films. Upon encountering the artwork, viewers are invited to create a customized short film based on various parameters including monsters, location, mood, landscape, etc; see the results generated by previous visitors; or write about what scares them most. Essentially this is a visual story re-mixer driven by a database of film clips that are categorized according to the parameters named above. No two short films unfold in precisely the same way. Video and audio clips can also be contributed to the databank through an online interface using various networked devices. Horror Stories was begun in 2009 with the help of the Verizon Foundation’s Thinkfinity Initiative for Technology and Research. The project was designed in Adobe Flash CS5, and programmed in Actionscript 2.0, one of Flash’s two native programming languages. Two Pace students assisted with programming (Julie Gill) and video capturing (Sean Colon) for the project. Unfortunately Ms. Gill and we encountered limitations in the technology, and the project could not be fully realized without being redesigned from the bottom up. This spring, Professor McDonald began searching for more opportunities to rework or redo the project and fix the things that did not turn out as envisioned. We applied for a few grants throughout the semester and found this research initiative which aligned with what we wanted to accomplish. We are very excited about the opportunity to make the application even better and be able to release it to the public with pride. Upon acceptance to this grant, we quickly began researching the best way to carry out our vision. After extensive research of new programming languages and ways of implementing what we wanted, I proposed to Professor McDonald that we start the project over in a more efficient language. Knowing what we know about the goals of the app now, restarting with the end goals in mind will no doubt make for a cleaner and better-designed application. Professor McDonald had originally designed the application in Flash and ActionScript 2.0 and I included PHP functionality including video upload and streaming. The problem is that Flash ActionScript 2.0 has been an old language for a long time. Instead of updating the application to latest Flash language, ActionScript 3.0 (not an easy feat in it of itself), we decided to scratch Flash altogether because of two main reasons. One, functionality from a coding standpoint is more efficient in many other languages; and two, iPad users cannot use Flash and therefore could not view our application. I researched many new web technologies and languages with the features in mind. We know that video upload and play is the most important thing so the main criterion when researching languages is the video support offered by the language. I found that Ruby on Rails, a new and cutting edge web programming language, has the best support for video uploading and YouTube support. Because of this, I am learning Ruby on Rails for the purpose of this project, and in order to ensure that the project will be successful using this language, I have begun to prototype the most important features. The earlier we realize that key features cannot be implemented in the language, the easier it will be to switch to another language with the least amount of work lost. There are two main features that I need to make sure I can implement in whichever language we choose. First, Flash allows for relatively easy creation of complicated animations, and I need to be able to duplicate that without the help of Flash’s libraries. Thus far, I have prototyped the animations that were previously created with Flash using HTML, CSS, and jQuery animation libraries. The main animation features have proven possible with the new language, which is promising for the overall use of this language. Below is a screenshot of the main page prototype. Second, I need to implement video upload and streaming capabilities. One main goal of the project is to allow users to upload their own scary video clips to expand the library of videos and create a more rich experience. Video upload and streaming are two complicated features in any web language, but so far Ruby on Rails seems to have the best solution. There is a working, open-source demo application with the capability to upload a video straight to YouTube, solving problems of video conversion and compression, which uses a large amount of server resources, as well as the problem of inconsistent video types and managing user content. That responsibility will be left to YouTube, and we can simply play the YouTube videos on our site. Below is a screenshot of a working Ruby on Rails Demo for YouTube Uploads. The next step in this process is to continue implementing features in the prototype. There are many more pages and animations to create, and now that we have proof of concept, we can begin developing. At this point, we can make the animations and the look and feel exactly how we want because we are starting fresh. We can make decisions about what each piece will look like as we build it.